February has been busy for activities within our Company and in the Livery world. The February Court meeting was preceded by a meeting of the MALT group (Military Affiliates Liaison Team) at which the activities of all our military affiliates were reviewed. These will be communicated to the Livery though regular updates on the website and newsletters. A lot is happening. At the Court meeting we admitted four new Liverymen who were the first to receive the new Liveryman certificate. Paul Hick, David Croll and brothers Iain and John Stirling. It was considered by the Court to be appropriate to mark the admission into the Livery with a certificate as we are one of the few Companies not to do this. Our thanks to Damian Riley- Smith for his help in their design and production. It is planned to make available these certificates for existing Liverymen at a nominal charge for those who may regret not having received one in their admission to the Livery. More details will be given in due course. We also welcomed onto the Court as Court Assistants Garvin Brown IV and Justin Hicklin. Trevor Stirling became a Steward. Major Jamie Barklem of London Scottish Regiment and Commander Duncan Thomas of 825 NAS were presented with the Company Freedom as was Dr Dawn Maskell Director of the International Centre for Brewing and Distilling of Heriot-Watt University in Edinburgh. Gary Horsfield of William Grant received his Freedom as a Corporate Associate. The lunch at Vintners Hall was very well attended and our guest speaker Tony Hales who had been CEO of the Allied Domecq Group in the 1990s explained how exciting and unconventional the marketing of spirits had been at that time in the emerging markets of Asia Eastern Europe and Russia. 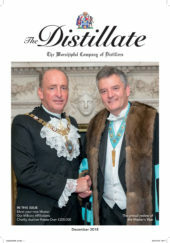 We were joined at the Stirrup Cup by the Mistress and Consorts who had been lunching at Innholders’ Hall and who with their guest speaker Fiona Adler, a recent Sheriff’s Consort, were offered a warming glass of whisky, port or Armagnac. However, it transpired they had already had enjoyed a glass of Armagnac at Innholders to help them on their way to us! I was pleased to introduce the new Development Director Clive Bairsto to the Livery during the lunch and for Clive be to be able to meet many Liverymen during the Stirrup Cup. Clive will join us formally in mid March working on a part time basis to help implement the many projects we have identified in our strategic plan and will be briefed by the Master and Wardens as part of his induction schedule. Indeed, Clive has already attended a meeting of the Industry Committee as part of this pre-joining induction, as well as being present at the Gin Magazine Awards, where I was delighted to present PM Hayman with the prestigious Gin Magazine Hall of Fame Award. The previous winner was PM Maxwell! I have been invited to many events during the month including the Installation Dinner of the Master Marketor in Drapers Hall and the 450 th anniversary of the Worshipful Company of Basketmakers at the Guildhall. An exhibition of their work was opened by the Duchess of Gloucester, which included the giant wicker figures of Gog and Magog which stood at the entrance to the Guildhall. These two mythical figures are the traditional guardians of the City of London and have appeared in the Lord Mayors Show since the reign of Henry V. These wicker figures were made by Liverymen from the Worshipful Company of Basketmakers a few years ago. Gog and Magog are also represented permanently as wooden statues in the Guildhall. They are descended from mythical pagan giants and their origins lie in the medieval legends of the early British Kings as recounted by Geoffrey of Monmouth in the 12 century which tells of the formation of Albion or Britain itself. Their adoption by the Guildhall and the Lord Mayor symbolise, “Defending the honour of their country and the liberties of this their City” as described in the, “Gigantick History of the two famous Giants ” written in 1741. The high point of the month was the Channel Dash Commemorative Lunch hosted by Commander Duncan Thomas at 825 NAS in Yeovilton. The story of exceptional bravery and courage by the 18 men of the Fleet Air Arm in 1942 who took on the might of the Luftwaffe and the German fleet in their flimsy Swordfish planes each equipped with a torpedo is inspirational for its daring and self sacrifice. A 96 year old Swordfish veteran was present to tell us what it felt like to be in a Swordfish during armed conflict. We were all humbled by his stories and his manner, which was an uplifting combination of modesty humour and fortitude. The month ended with two fascinating lectures chaired by different Livery Companies. The Glass Sellers in Middle Temple hosted a lecture by a leading surging Sir Roger Kneebone on the theme of, “Thinking with our hands” and the importance of a steady hand in all craftsmanship – whether it be surgery or glass engraving. The World Traders invited Christine Lagarde, the Head of the International Monetary Fund, to deliver a lecture in the Guildhall on, “Redefining a Broader Sense of Purpose for the Financial Sector.” Mme Lagarde was clear in her message that finance needs to be at the service of business and people and not the other way round – and she successfully avoided any reference at all to Brexit during the evening – much to the relief of all present!